For over 40 years, March 8 has officially been International Women's Day, however, the past few years have signalled a shift in how women's rights and how we approach them, and every day there's an opportunity to fight against the issues afflicting women across the globe. From the Women's March in 2017, which was attended by over 6 million people worldwide, to the #MeToo and Time's Up movements of recent months (not to mention greater awareness around such key topics as period poverty and domestic violence), women's issues are getting more attention than ever. Rightfully so. In parallel, and as a response to this, fashion has taken on the feminist message in its most literal form. In 2014 Chanel models led a, albeit controversial, feminist march down a catwalk, and in 2017 Maria Grazia Chiuri's first collection for Dior included T-shirts with the "We Should All Be Feminists" message from author Chimamanda Ngozi Adichie's 2012 TED talk of the same name. In fact, wearing slogan T-shirts has become a vital way to get across important women's rights messages, and not just on the catwalk. In 2013, Green Party Leader Caroline Lucas wore a No More Page Three T-shirt to make a point about the Sun's continued publication of naked women. So what is it about the slogan or protest T-shirt that's become integral to giving a platform to women's rights? I spoke to Dennis Nothdruft, head of exhibitions at the Fashion and Textile Museum, which is currently running T-Shirt: Cult - Culture - Subversion, who not only gave me a brief history of the protest T-shirt but also why they're so impactful. "Plain white T-shirts were originally co-opted by the likes of James Dean and Marlon Brando, who wore them as outerwear [they used to only be worn under shirts so this was a subversive thing to do]. But it was in the '60s when T-shirts became political. Young people were able to screenprint slogans, and the T-shirt became a billboard to protest. Then, of course, people like Vivienne Westwood and Malcolm Mclaren came along in the '70s and used T-shirts to shock and offend people. 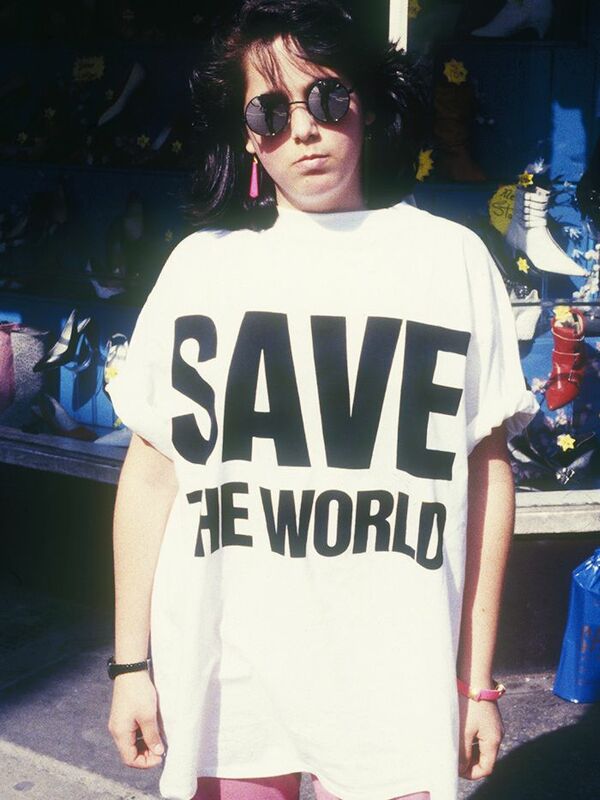 After that, it was Katharine Hamnett of the early ‘80s with her bold slogans that championed causes such as Campaign for Nuclear Disarmament." However, when it comes to why the protest T-shirt is so impactful, Nothdruft puts it incredibly succinctly: "Their strength is their ubiquity. We advertise how we want to be perceived. And a T-shirt allows you to do that without being confrontational." I decided to speak to the women who are currently creating and wearing protest T-shirts, what it means to them, as well talking about the women's rights issues that matter to them right now. From the iconic Katharine Hamnett to Tennessee Thomas, who runs the Deep End Club, these five women have something to say both on, and off, a jersey crew neck. "I believe the T-shirt is one of the most iconic inventions in fashion history. I’m drawn to the fact that it attaches a message to the body of a person or group of individuals and is stitched to his or her identity—simple, affective yet extremely powerful. What’s even more important is that is can be timeless, a good slogan T-shirt can be used time and time again. However, there is always the danger that the trend or hype would have greater importance than the actual message itself; I guess this is a general risk that designers take in fashion. Inspired? Check out the International Women's Day website for more.